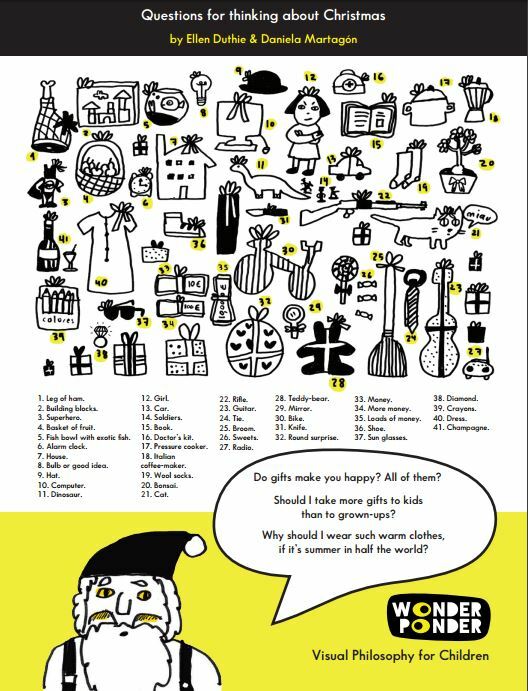 Wonder Ponder is a website that specialises in visual philosophy for children over the age of eight. It uses engaging scenes and intriguing questions to prompt reflection and discussion, thereby encouraging children to develop their own thoughts and arguments and to build a visual and conceptual map. 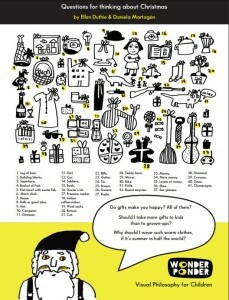 Would you like Christmas if there weren’t any presents? Do you prefer a wrapped present or an unwrapped one? Why? Could Christmas make some people sad? Why? Is there such a thing as a bad present? Is it fair for those that behave badly not to get any presents? Are traditions good? Is it important to keep them? Do we behave better with other people at Christmas than at other times of the year?